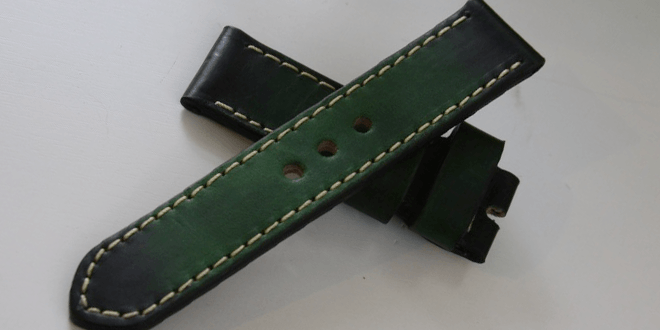 This week we take a look at another fine strap made by Pulchers Leather. This time we went a little outside the box and selected the green Amazone strap from their Suit Matchers collection. The Amzone is made of genuine calf leather that is a 2 layer design and dyed to the perfect green color. The overall thickness of the 2 layer design brings this strap to about 4mm all the way around. At both ends of the strap the lively green color blends to a black which creates a worn and antique look to the strap. This transition cuts down the green color and makes it bearable instead of popping right at you. The edges of the strap are finished beautifully and painted black leaving the strap looking like one solid piece of leather instead of the 2 layers showing through. This black edging also completes the strap nicely given the dark transitions on the edge of the strap. The stitching on this particular strap is done in a ecru color which lends to a nice contrast with the strap itself. The stitching of course is done by hand and on this particular piece I did notice a bit of variation on the length of the stitches. It is a very subtle variation but for the price point I would have liked to see the stitching be a bit more precise. This strap does come with a with a buckle for the $130 USD price point but can be bought without for $105.00 USD. The Amazone comes with 3 pre punched holes which aren’t that many but fit my wrist perfectly. I am sure you can get more holes punched if you request them. The leather that is used on the Pulchers strap will take a few wears before it becomes a bit softer. I would rate this in the middle of the spectrum when it comes to the actual flexibility of it. Once again I have to say that I do enjoy my new Pulchers strap as I have the ones before it. It’s definitely a durable and quality made strap that will take on the wear and tear of everyday use on your Panerai. Stitching could have been a bit more precise for the price. I agree with you. I just bought this series of strap as well. The strap has just arrived three years ago. The color was unique. The leather is very convenient to be worn. Pulcher’s Leather never disappoint me though. Worth to buy! Thanks for the reference. I directly purchased one after reading this. My strap just came yesterday. I purchased the ammoed series. It’s as good as the picture on the website. Expectation satisfied. Totally agree with this post. I bought Pulcher’s leather strap 6 months ago. Thankfully, the leather is durable enough for me who’s little bit careless. I bought the suitmatcher series. It has dark brown color. By the way, do you guys have any recommendation for another strap beside this brand? Check out the rest of our Panerai Strap reviews in that section up top. Thanks for the great feedback as well.